Last week in our series, we talked about the election of Martin Van Buren in eighteen thirty-six as the eighth president of the United States. Van Buren had been very close to the outgoing president, Andrew Jackson. Van Buren had been successful in forming a strong political alliance that helped put Jackson in the White House in the election of eighteen twenty-eight. Jackson was grateful for Van Buren's help, and asked him to come to Washington to serve as secretary of state. Van Buren had just been elected governor of the state of New York, but decided to accept Jackson's offer. This week, Steve Ember and Gwen Outen talk about Martin Van Buren and the start of his presidency. Van Buren quickly became the most powerful man in Jackson's cabinet. He was able to help Jackson in negotiations with Britain and France. But his greatest help was in building a strong political party for Jackson. It was this party that gave Jackson wide support for his policies. Van Buren built up the national Democratic Party with the same methods he used to build his political organization in New York state. He removed from government jobs people who had not supported Jackson. These jobs were then given to those who had supported the president. Van Buren served as secretary of state for two years. He resigned because he saw his resignation as the only way of solving a serious problem Jackson faced. The problem was Vice President John C. Calhoun. Calhoun had presidential hopes. He did not think Jackson would serve more than one term. And he planned to be a candidate in the next election. Three of the five men in Jackson's cabinet supported Calhoun. Jackson could not trust them. And he wanted to get them out of the cabinet ... but without a political fight. Then, later, he named Van Buren minister to Britain. 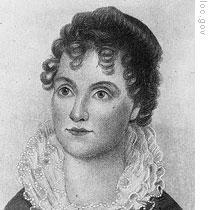 But Calhoun's supporters in the Senate defeated Van Buren's nomination. By this time, Jackson had decided that Van Buren would be the best man to follow him as president. He offered to resign after the eighteen thirty-two elections and give Van Buren the job of president. Van Buren rejected the offer. He said he wanted to be elected by the people. But he did agree to be Jackson's vice president in eighteen thirty-two. Four years later, at Jackson's request, the Democrats chose Van Buren to be their presidential candidate. He was opposed by several candidates of the newly formed Whig Party. The opposition was divided. And Van Buren won the election with little difficulty. Andrew Jackson stood beside Martin Van Buren as the new president was sworn-in. Physically, the two men were very different. Jackson was tall, with long white hair that flowed back over his head. Jackson's health had been poor during the last few months he spent in the White House. He seemed tired. There was almost no color in his face. Van Buren was much shorter and had much less hair. His eyes were brighter than those of the old man next to him. In his inaugural speech, Van Buren noted that he was the first American born after the revolution to become president. He said he felt he belonged to a later age. He called for more unity among Democrats of the North and South. He said better times were ahead for the country. Van Buren had a strange way with words. He could talk with excitement about something, but say very little about his own feelings on the subject. Once, he spoke in New York about the tax on imports. Two men who heard the speech discussed it later. "It was a very able speech," said one man, a wool buyer. "Yes, very able," answered his friend. There was silence for a moment. Then the first man spoke again. "Was Mister Van Buren for or against the import tax?" The new president was a warm and friendly man. He tried to keep his political life and his social life separate. It was not unusual to see him exchange handshakes, smiles and jokes with men who were his political enemies. Van Buren had a poor education as a boy. He went to school only for a few years. His father was a farmer and hotel keeper at a little town in New York state. Van Buren had a quick mind and was a good judge of men. But he always felt he could have done more had he received a college education. 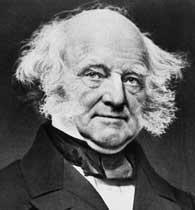 Van Buren had been president for just a few days when an economic crisis and a political storm struck the country. The storm had been building for many months. It really began with the death of the Bank of the United States more than a year before. 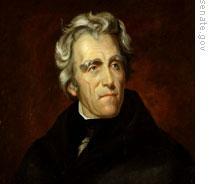 Andrew Jackson had opposed the powerful bank in which the government's money was kept. He vetoed a bill that would have continued it. The bank was so strong that it was able to control the economy throughout most of the country. It did so through its loans to businessmen. By making many loans, the bank could increase economic activity. By reducing the number of loans, the economy could be tightened. The Bank of the United States also helped to control the smaller state banks. It refused to accept the notes, or paper money, of these banks, unless the state banks were ready to exchange the paper for gold or silver money. After the end of the Bank of the United States, there was little control of any kind over the state banks. 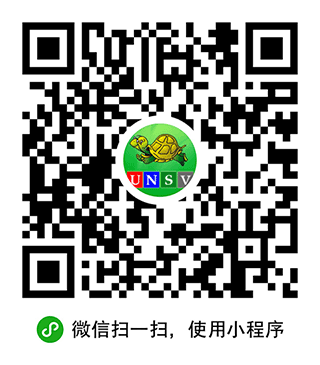 Many new state banks opened. All of them produced large amounts of paper money -- many times the amount they could exchange for gold or silver. Much of this paper money was used by business speculators to buy land from the government. These men bought the land, held it for a while, then sold it for more than they paid. The government soon found itself with millions of dollars of paper money. To stop this, President Jackson ordered gold or silver payments only for government land. This made it necessary for speculators to exchange their paper notes for gold. Many banks could not do this. They did not have enough gold. There was another problem. Congress passed a law on what was to be done with federal money not needed by the national government. This extra money, or surplus, was to be given to the states. Since the closing of the Bank of the United States, the government had kept its money in a number of state banks. Now these banks had to surrender the government surplus to the state governments. This left even less gold and silver to exchange for the huge amounts of paper money the banks had issued. There was still another demand for what gold the banks had. Eighteen thirty-five and eighteen thirty-seven were bad years for American agriculture. Many crops failed. Instead of the United States exporting farm products to Europe, the opposite happened. American traders had to import these things from Europe. And they had to pay for them in gold or silver. As more and more paper money was put into use, the value of the money fell. Prices rose higher and higher. Poor people found it almost impossible to buy food and other necessities. In eighteen thirty-five, a barrel of flour cost six dollars. Two years later, the price had jumped to more than twelve dollars. The same was true with meat and other foods. Even coal, the fuel people used to heat their homes, cost twice as much. Poor people protested. But businessmen were satisfied. They wished to continue the flood of paper money. Violence finally broke out at a protest meeting in New York City. A crowd of angry people heard speakers criticize the use of paper money. Some in the crowd began demanding action against the rich traders. A crowd of about one-thousand marched to a nearby store, broke into it, and destroyed large amounts of flour and grain. In the spring of eighteen thirty-seven, the demand on banks for gold and silver grew too heavy. The banks stopped honoring their promises to exchange their paper money for gold. They said this was just temporary. That it was necessary to stop -- for a while -- all payments in gold or silver. The crisis got worse. Our program was written by Frank Beardsley. The narrators were Steve Ember and Gwen Outen. Transcripts, MP3s and podcasts of our programs are online, along with historical images, at www.unsv.com. Join us again next week for THE MAKING OF A NATION - an American history series in VOA Special English. this is a good class of economic lesson. what is economic crisis? it is just the flood of paper mony whose value is lowered under its pratical needs of buying things. and at this circumstances, the issue of paper currency is badly over the reserves of gold and siver in national bank.